All it requires are a few basic rules to house train puppies within a short amount of time, sometimes as little as a few days to a few weeks. This does not mean that the puppy will be able to be trusted to wander throughout the home without eliminating. What the puppy should quickly learn is where it should eliminate, and the consequences of eliminating indoors when the owner is supervising. However, anytime your puppy is unsupervised and eliminates indoors, this can further delay successful house training since the puppy will have learned that there are alternate indoor elimination areas that can be used without untoward consequence. The goal of house training is to encourage and reinforce desirable elimination. Do not focus on trying to teach your puppy where it is not allowed to eliminate, as there are literally hundreds of locations in your home where your puppy might have to be deterred. It is advisable to select a site that has an easy and direct access to the outdoors. Puppies may more easily learn where to eliminate if a single location is used. Over time, the location, the substrate (surface underfoot), and the small amounts of residual odor help to establish a more regular habit of returning to the area. If you do not have immediate access to the outdoors (e.g., high-rise living) or if your schedule requires that you leave your pet longer than it can control itself, you might need to train your pet to an indoor litter area. If this is your best option, you can follow the same procedures outlined below, but will instead take your pet to its litter area, rather than to the outdoors. Paper training, discussed below, is another option. However, it may be more difficult to train your pet to eliminate at one site (e.g., indoor litter) and also expect it to eliminate in other sites (e.g., outdoors). 1) Puppies have a strong urge to eliminate after sleeping, playing, feeding, and drinking. Take your puppy to its selected elimination area within 30 minutes of each of these activities. In addition, although some puppies can control themselves through the entire night, most puppies need to eliminate every 3 to 4 hours during the daytime. With each passing month, you can expect your puppy to control itself a little longer between elimination times. The puppy should be taken to its elimination area, given a word or two of verbal encouragement (e.g., “Hurry up”) and as soon as elimination is completed, lavishly praised and patted. A few tasty food treats can also be given the first few times the puppy eliminates in the right spot, and then intermittently thereafter. This teaches the puppy the proper place to eliminate, and that elimination in that location is associated with rewards. Some puppies may learn to eliminate when they hear the cue words (“Hurry up”). 2) If you take your puppy to the elimination site and your puppy is only interested in playing and investigating the environment, take the puppy indoors after about 10 minutes and strictly supervise him until you can try again, approximately each half hour. Always accompany your puppy outdoors so that you can be certain that it has eliminated. When you first start house training, be certain to reward elimination immediately upon completion and not when the puppy comes back indoors. 3) When indoors, your puppy must be supervised so that you can see when it needs to eliminate and immediately take it outdoors to its elimination area. One of the best techniques is to leave a remote lead attached. Should pre-elimination signs (circling, squatting, sneaking off, heading to the door) occur, immediately take the dog to its elimination site, give the cue words, and reward the puppy when it eliminates. If the puppy begins to eliminate indoors you must be supervising so that you can immediately interrupt the behavior, such as with a verbal reprimand or shaker can. to eliminate though supervision and rewards." 4) When you are not available to supervise, the puppy should be confined to its confinement area (see handouts "Reasons to Crate Train Your Dog," "Crate Training Your Dog - An Overview" and "How to Crate Train Your Dog"). Be certain that your puppy has eliminated, and has had sufficient play and exercise before any lengthy confinement. Establish a daily routine that helps your puppy learn when it is time to play, eat, exercise, sleep, and eliminate (see handout "Using Enrichment, Predictability and Scheduling to Train Your Dog"). If the confinement area is small enough, such as a pen or crate, many puppies will have sufficient control to keep this area clean. This means that when you come to release the puppy from confinement, it must be taken directly to its elimination area. 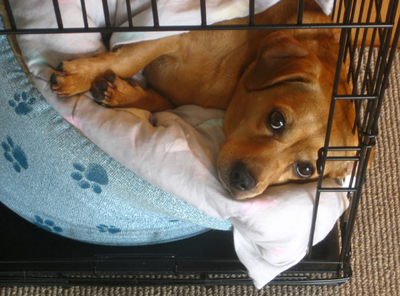 Puppies will generally avoid soiling their crate if they use their crates as a sleeping or play area. However, puppies that are anxious or distressed about being confined to the crate are likely to soil. In addition, if the area is too large or the puppy is kept in the area longer than it can wait to eliminate, the puppy may soil in a portion of the confinement area. 5) Indoor training: If your home does not provide easy access to the outdoors (e.g., high rise), then it might be necessary to consider an indoor area for elimination (dog litter, urinary pad, paper training). The steps are virtually the same as outdoor training in that you must determine the puppy’s schedule, supervise when you are home, and confine your puppy to an area where it will not eliminate (e.g., crate training) when you cannot supervise. However, rather than taking your dog outdoors to eliminate, you will need to direct your puppy to the indoor litter or pad, each time it is time for him to eliminate, each time he is released from the crate, and each time you see any of the preelimination signs. Choose a spot that is practical for you but also is appealing and has easy access for the puppy (i.e., one that he might choose on his own). To ensure that the puppy uses the site, be sure that he is controlled with a leash or that he can be confined to the location (e.g., inside a pen with the litter) until he is finished. Be certain to supervise in order to immediately reward elimination so that he is encouraged to return to the spot and to use cue words as he begins to eliminate (see outdoor training above for details). Also consider housing your puppy when you cannot supervise, in an enclosed area (e.g., pen or room) where he can use the litter but cannot gain access to other areas of the home where he might soil. Another option is to house your puppy in a pen or crate when you cannot supervise and to take your puppy immediately to its litter area when it is released. "...make sure the crate is located in a room or pen, where there is paper or litter pads covering any area that he might eliminate." 6) Paper training: Finally, if you must leave your puppy at home longer than he can control his elimination, until he is effectively trained you will need to confine him to an area where he is allowed to eliminate when you are not available to take him to his elimination site (outdoors, puppy litter). This is far from ideal since the puppy cannot be rewarded for desirable elimination and does not learn to control his elimination in his pen or crate and may be an excessive time to leave a young puppy without social interactions and exercise. Perhaps consider a dog walker or a family member who can take your puppy out once or twice while you are gone. There are a few options depending on your schedule and environment. The first, which might also help to improve control, is to combine confinement training with paper training. At times when you are able to take your puppy to his site and reward elimination (whether outdoors or indoor litter) and are leaving for a short enough time that he can control his elimination, confine him to his crate (as discussed above). However, if you are leaving for longer than he can control elimination, make sure the crate is located in a room or pen, where there is paper or litter pads covering any area that he might eliminate. After he begins to use specific sites, you can gradually reduce the size of his litter area and use rewards to encourage use of the area. If you choose not to use a crate for confinement, then you will need to confine your puppy to a room or pen, and cover the floor with paper or litter pads for elimination except for a corner that contains the puppy's bed and feeding area. Once the puppy starts to choose a few selected areas in the room or pen and becomes accustomed to eliminating on the litter material or paper or urinary pad, some of the paper or pads that are unused can begin to be taken away to make the site smaller. Proper design of this area can help you to have a rest and play area for the puppy as well as a litter area for the puppy with no access to other areas of the home while you are gone. Remember that when you are at home, you should be actively involved in house training by scheduling, supervising, taking your pet to the selected elimination site (whether outdoors or “indoor litter”), and use rewards and cue words to improve long-term success. There is no point in punishing or even pointing out the problem to the puppy. Only if the puppy is in the act of elimination will it understand the consequences (rewards or punishment). In fact, it is not the puppy that has erred; it is the owner who has erred by not properly supervising. Put the puppy elsewhere, clean up the mess, and vow to supervise the puppy more closely in the future. By regularly taking the dog outdoors, through the same door, to the same site, and providing rewards for proper elimination, the puppy should soon learn to head for the door each time it has to eliminate. If you recognize the signs of impending elimination and praise the puppy whenever it heads for the doorway, the behavior can be further encouraged. Puppies that have been interrupted or reprimanded on one or more occasions as they begin to eliminate indoors, may begin to try to sneak away, whine, or show some form of anxiety when they feel the urge to eliminate but cannot escape from the owner's sight. If you can pick up on these cues, and take the puppy directly outdoors for elimination and reward, the puppy may consistently begin to show these signals when he or she needs to eliminate, and may even begin to take you to the exit door. or bark to let you know it needs to go outside." Generally you will want your dog to have been error free around the house for about a month before you can begin to decrease your confinement and supervision. The first time you leave the puppy unsupervised should be just after taking the dog outdoors for elimination. Gradually increase the length of time that your dog is allowed to roam through the home without supervision while you are home. If the dog has been able to go unsupervised for a couple of hours without an “accident,” it might then be possible to begin going out for short periods of time. Of course, if the dog still investigates and chews, then confinement and supervision may still be necessary.